"So much owed by so many to so few. " The names of all 544 of the 'few'. Sleeve print : 'So much owed by so many to so few.' Battle of Britain 1940. Through the summer and autumn of 1940 the Battle of Britain raged in the airspace above southern England. ‘The Few’ comprised 2927 aircrew from Great Britain and overseas. 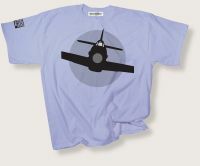 Within the RAF roundel and its background are listed on our T-shirt, in chronological order, all the 544 men who sacrificed their lives for the cause of freedom against fascism during the period of the Battle. Wear it with pride, against fascism then and now. Unisex sizes small (36 inch chest/90cms) medium (40 inch /100cms), large (44inch /110cms), XL (48 inch/120cms) and XXL (52 inch/130cms).Available as listed in drop-down menu below. Gift Wrapping serviceprovided with special Philosophy Football wrapping paper and gift tag! To personalise your tag add the message you would like included in the box also below.